Made in Herisau, Kanton Appenzell Ausserrhoden, Switzerland, Europe, 1927-1929. Beaches and jaunts to the country became a very important part of summer life by the mid 1920s. The motor car opened up a whole new social life and there was a need for a different wardrobe to go with this new physical activity. Spectatorship was as important as participation. ‘Taking the waters’ at spa resorts - particularly in Germany and Italy - had already established the need for numerous daily changes of clothing to match the mood of the moment. 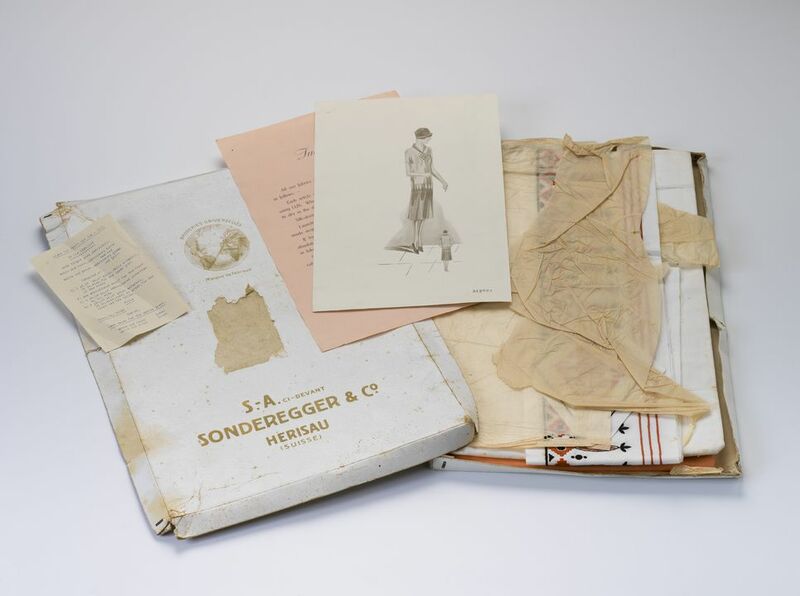 A kit of fabric and embroidery in its original packaging to make a casual dress for 'sport and seaside'. There are four pieces of fabric: a length of coral linen or cotton (possibly imitation linen), tied with ribbon; a length of cream linen or cotton tied with ribbon; a border pattern, cream coloured, with coral and black stylised fold pattern embroidery; and a diamond-shaped embroidered motif to be placed at the front of the garment. Paper material accompanying the fabric includes: labelled cardboard box with wrapping tissue; washing instructions; illustration of the finished product; and a list of contents. The list of contents gives measurements for the fabric: the white or cream linen is 1 yard 19 inches long and 30 inches wide and is to be used for the upper part of the dress; the larger border pattern is 1 yard 19 inches long and 4 1/2 inches wide and the coral material is 2 yards 10 inches long and 30 inches wide, to be used for the skirt and the collar. Printed on lid of box, 'BRODERIES UNIVERSELLES / Marque de Fabrique / S.-A. CI-DEVANT / SONDEREGGER & CO / HERISAU / (SUISSE)'. The kit was made by Sonderegger & Co in Herisau, Switzerland, 1927-1929. The accompanying page which lists the contents indicates that the kit came in two models: one with white and coral material and black and red embroidery and the other with white and green material and green and lilac embroidery. This example is obviously the first of these. The white and coral model had a code word of 'Quael', while the white and green model's code word was 'Quagn'. The style number, presumably covering both versions, was 31283. The kit came into the possession of Megan Waters, possibly from a family friend, from a house in Warwick, Queensland. Ms Waters offered it to the Powerhouse Museum in late May 2003.